The PP Princess Villas are an extension of the already existing PP Charlie and PP Princess Resort. Visit this stunning island and you can now experience luxury in one of nine perfectly formed modern apartments, split over two levels ,with an outdoor terrace and pool access. 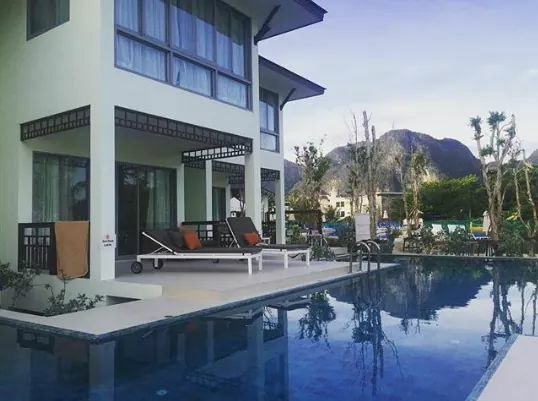 The one thing to bear in mind if you’re travelling as a two or a family, is that three villas share one pool – so be prepared to share your villa with the next door neighbours unless your party is occupying the whole block (three apartments). Koh Phi Phi is a beautiful island and growing in popularity every year. When I first visited in 2009, I fell in love with its simplicity and its size – back then it was an island still recovering from the devastation of the Tsunami. You have absolutely everything you need on the doorstep and all within walking distance. In fact, the island is so small, it’s actually only accessible by boat! There are no roads. My insider tip: make sure you request your hotel comes to collect you from the pier with a cart to carry your cases or backpacks! Made famous by the film ‘The Beach’, Phi Phi is now full throng with Ibiza style beach parties during the day – PP Princess hosts its own chill out session called Lei in the pool area. And at night, the beautiful beaches become a wild party with fire shows, free shots and banging techno music, while the bars in town are the place to soak up a Sangsom bucket and a spot of beer-pong! The PP Princess Pool Villas themselves are somewhat of a hidden gem even though they occupy a prime location on the island. They’re quite secluded, yet all facing the beach for stunning sunset views – hidden by trees and greenery and surrounded in pretty flowers which divide you form the main PP Princess pool area. On the ground floor of the villas, you’ll find comfortable and stylish lounge areas with corner sofa, drinks cabinet and a desk with patio doors leading out to the pool area. Upstairs boasts a double bedroom with beautiful sea views across the Loh Dalum Bay and a huge dressing room area with connecting toilet and shower room. 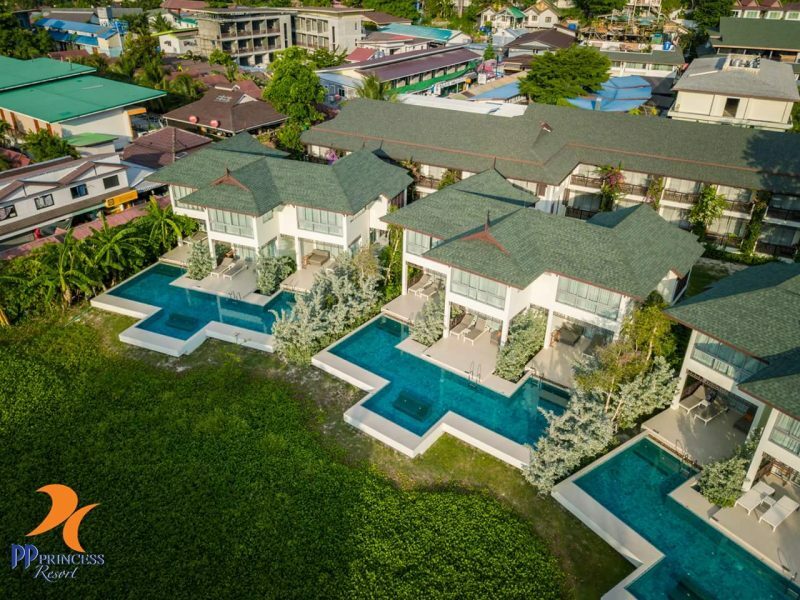 I loved the decor – no hint of traditional Thai style whatsoever – just stylish, minimal luxury, while the patio area has two padded loungers and relaxing outdoor sofa, and each section of the pool ensures you have a jacuzzi area each. Breakfast and buffet style dinner offer up plenty of choice. In the morning, there’s everything from beef lasagne to cooked omelettes, crispy bacon, juices, coffees and teas. In the evening, again, there’s a huge selection from traditional Thai food to fresh fish, barbecued meat and salad. If you’re looking to party while you’re on the island, this is most definitely the spot. Luxuriate in your private pool with jacuzzi jets through the day, indulge in the mod-cons of the villa early evening, and then hit the bars. Beware – it can be loud, as the Phi Phi Princess Villas back right onto the main event – Slinkys! However, a pair of ear plugs solved this problem straight away and with no alarm to wake me up in the morning, I slept extremely well in the generously sized double bed. 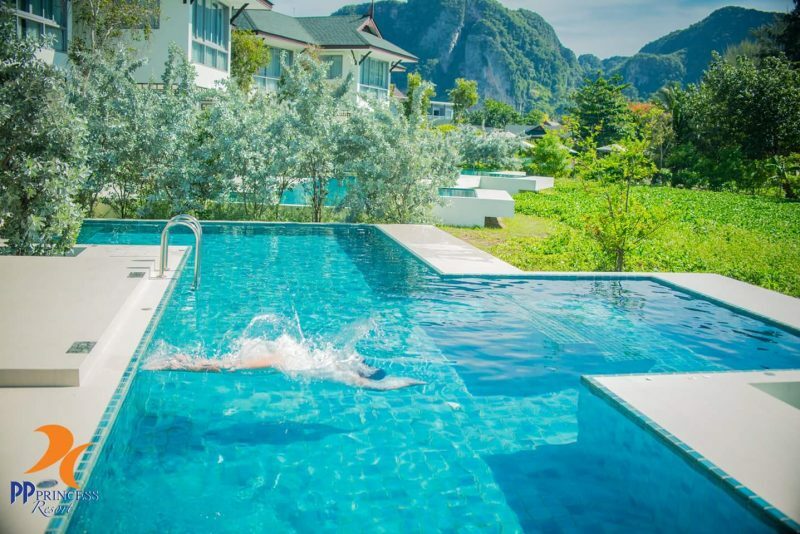 Without doubt, if your main priorities are luxury and location, then the Phi Phi Princess Villas are for you!